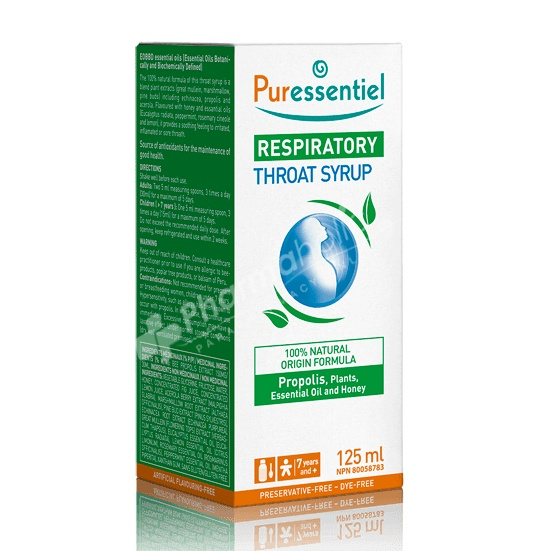 The 100% natural formula of Puressentiel Respiratory Throat Syrup combines essential oil of eucalyptus radiata, ideal for soothing the throat, pharynx and vocal cords, essential oils (peppermint, rosemary, cineole and lemon). ), plant extracts including echinacea, honey, propolis and acerola. This syrup for the throat is a food supplement with a pleasant taste, thanks to echinacea which contributes to the proper functioning of the natural defense system. Begin by shaking this syrup before each use. For adults: 2 scoops of 5 ml, 3 times a day for 5 days maximum. For children over 7 years: 1 scoop (5 ml) 3 times a day for a maximum of 5 days. Keep this syrup throat cool and use it within 2 weeks after opening. piperita) ), thickener: xanthan gum. Keep this syrup for the throat out of reach of children. Not recommended for children under 7, pregnant women, breastfeeding and people allergic to bee products. Keep out of reach of young children. Do not exceed the recommended daily dose. Excess use may result in laxative effects. Not a substitute for a varied and balanced diet and a healthy lifestyle. To preserve, before opening, in a dry and cool place.